The team behind Nasa's Dawn mission to Ceres has released striking new images, but remains unable to explain the dwarf planet's most intriguing mystery. 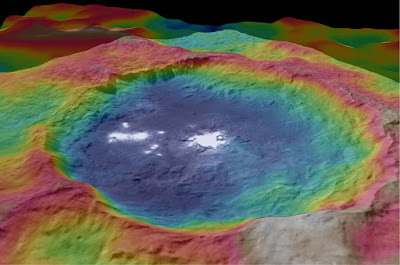 Bright spots within a 90km-wide crater have baffled scientists since the probe spied them on its approach. Now in orbit around Ceres, Dawn is gathering detailed data about the world's geology and its composition. Mission researchers described the latest images at the European Planetary Science Congress in Nantes, France. Currently, their best guess to account for the spots is an expanse of some type of salt - but this is speculation. "We haven't solved the source of the white material," said the mission's principal investigator Chris Russell from the University of California Los Angeles. "We think that it's salt that has somehow made its way to the surface. We're measuring the contours, trying to understand what the surface variations in that crater are telling us." Ceres is a 950km-wide dwarf planet sitting in the Solar System's asteroid belt. Dawn is currently orbiting it at a distance of 1,470km and imaging the entire surface every 11 days.